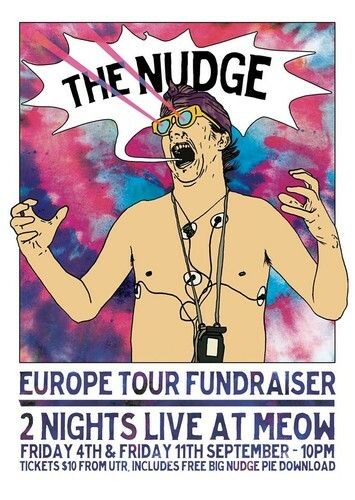 The Nudge are due to perform two rocking nights at Meow, to help prepare for their upcoming tour to France, Holland & Greece. “This is not just about raising some extra money to help over in Europe..” says organist James Coyle, "..its about trying news things, and performing to the people that we know and love in our home city, before heading out into the world.."
The Nudge are due to travel to France in September as part of composer John Psathas’ multi-media WW1 commemoration composition, No Man’s Land. Making the most of the opportunity on the continent, The Nudge will then go on to play their unique style of party psychedelic blues to audiences in Champagne, Brittany, Amsterdam & finally Athens.
" 4 BAND'S WATERTANK FUNDRAISER"